Remember, this is a self guided tour of coops and you must be self sufficient with food, water and bike repairs. Coops are only open from 9AM to 4PM, just on Saturday September 16, 2017. Routes and Map links are listed at the bottom of this page! First, we recommend you get a quick preview of the variety of coops, community gardens, and urban farms available this year on the tour by viewing the coop list summary by city below. Find a tour that fits your available time, location and selection of coops! There is something for everyone! You may want to do a particular coop loop but then go and directly visit another single coop not on that route you biked. Coop List Summary – Click here to view a complete summary with pictures of individual coops by city for 2017 tour! Need to rent a bike? 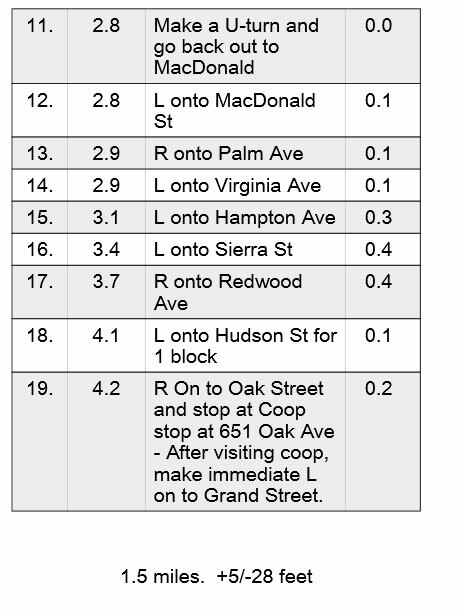 There are some bike rental places near the coop tour loops near to Caltrain stations. Check out our Coop Tour bike rental page for some options. Note: There are no scheduled post tour social events scheduled so far.. Check back later on this page in case on gets scheduled. Routes, coop loops and navigation to coops! This year we have 31+ coops from San Mateo to San Jose. If you want to navigate to the coops only using Google maps with individual coops, click on the image below and save that webpage link on your phone! Note: This google map does not have any route- coop loop information. We recommend you follow our coop loops below if you want to cycle between coops. This year we are offering several routes to serve a variety of coop tourists cycling abilities from family friendly to the serious coop metric century (50K) events. That’s a lot of mileage and coops too! Each route has information provided in a few formats. Cue Sheets The most valuable navigational document is the cue sheet. Included with each tour is a CUE sheet marking every right/left turn. Printable Maps – With each tour will be printable maps you can download and print yourself. Simply click on the map and you will get the full resolution of one map per page and print it on a color or BW printer. Ride With GPS Maps – Another option we provide to help you navigate the coop loop is a link to the RideWithGPS map of the coop loop. You can view the routes on full screen browsers or you can also download and install the RideWithGPS mobile APP from rideWithGPS.com for your iphone or android. The RideWithGPS app is a monthly service app that allows you to run GPS based Google type navigation of the routes we created. It also does much more and allow you to create and share rides and routes. Note – Plan to spend some time downloading and playing with the app ahead of time if you wish to navigate using the app on your phone. Please review the Coop Route Navigational Options page for more details on how to use the various formats. Click on each route below to see the individual route details and maps and cue sheets. More Serious Cyclist Routes – This longer route is designed for proficient cyclists who are comfortable riding on longer rides. Questions or issues? Feel free to send organizers an email at SVTourDeCoop@gmail.com.